Shortly after Noriko arrives at the Shitos’ Tokyo home, a strange, slightly disheveled neighbor approaches her while she works in the garden. Though Kimie is quick to dismiss him as a troubled tenant who’s fallen on hard times, Noriko can’t shake the feeling that the neighbor was about to divulge something damning — a feeling intensified by his mysterious death in a fire several days later. The Shitos’ oddly muted, impersonal response to his death further arouses Noriko’s suspicion, as do the family’s clandestine midnight meetings. Though the Shitos offer reasonable, measured responses to Noriko’s inquiries, she begins wondering if the Shitos run an illicit business… or worse. “Great Granny’s been watching people for ninety-eight years — she can see through them at a glance, so lots of people in the neighborhood come to ask her for advice.” He explained how delighted he was that Great Granny had taken a liking to her; it showed that he hadn’t been blinded by attraction. He felt like the luckiest man in the world for having found someone of whom his family approved. Unfortunately, Nonami is never content to let a passage like this one stand alone; she feels compelled to explain how Kazuhito’s words swayed Noriko by telling us exactly what Noriko is thinking at the moment he gives this speech. The obviousness of Noriko’s interior monologues is especially frustrating; Nonami does a competent job of revealing her characters’ motivations and feelings through their actions without resorting to such editorial interventions. The other drawback to Nonami’s storytelling is that she begins telegraphing the ending just a few chapters into the book. Savvier readers will quickly figure out what the Shitos’ secret is — and it’s a doozy — though they probably won’t mind wading through another hundred pages to have their ickiest suspicions confirmed, especially since Nonami manages a few surprises in the final pages. The bottom line: Now You’re One of Us is an entertaining, atmospheric potboiler that’s probably best read in the privacy of one’s own home. This review originally appeared at PopCultureShock on 2/8/08. 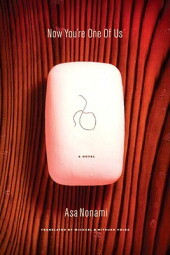 NOW YOU’RE ONE OF US • BY ASA NONAMI, TRANSLATED BY MICHAEL AND MITSUKO VALEK • VERTICAL, INC. • 240 pp.